Tomorrow will be my party day - the day I go off the diet and eat what I want, within reason (although, traveling for work last week resulted in multiple party days). You know I love me some Chick-fil-A and tomorrow will be one more reason I love them, a free chicken sandwich for doing my American duty, voting. Many Chick-fil-A restaurants around the country are offering a free chicken sandwich in exchange for your "I Voted" sticker on Nov. 4 & Nov. 5. Check with your local Chick-fil-A and see if they'll trade your sticker for a sandwich. By the way, I see they have a new Peppermint Chocolate Chip Milkshake. Yum! It's only available through January 3, 2009. Think I'll be sampling one of those tomorrow, too. 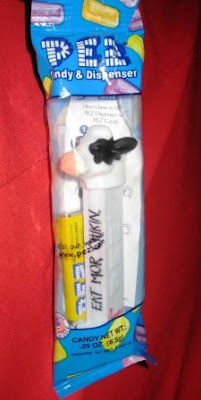 Oh, and if you're looking for stocking stuffers for your favorite Chick-fil-A fan, checkout the PEZ dispenser I picked up at the restaurant in Port Charlotte, Fla. It's lemonade flavored! For you coffee drinkers, Starbucks is giving away a free tall cup of coffee on Nov. 4 when you let the barista know you voted. They don't ask for the sticker, just your word that you did your American duty. Updated, 10:16 p.m.: Somewhat Frank found some other freebies for Election Day, check them out. Don't forget to check out my brush with politics this year. I really want that PEZ dispenser (I have a nice collection back in the states). Wonder if Starbucks in China will give me a free coffee if I tell them I voted. Don't have any proof though.